Last April 20, 2017, a handful of our developers had the privilege of attending the AWS Summit Manila held at the Marriott Grand Ballroom. The event consisted of keynotes and talks from company presidents, managers, chief officers, and architects, from various international entities such as Github, local businesses such as M. Lhuillier, as well as Amazon itself. The talks were broken down into two tracks, each with their own hall, called Business Transformation, and Innovating On The Cloud. We learned about how Amazon Web Services can help businesses, tackling topics such as reduced costs, ease of migration, and storage. We were given a glimpse into innovative means to better serve customers, the use of AWS Data and Analytics Services to get better insights in decision making, and the use of cloud storage to serve enterprise workloads. Also showcased were up-and-coming technologies designed to help programmers, testers, and leads in developing content faster, easier, and more securely. The fun demonstration of artificial intelligence through voice and face recognition for home security stole the show when the presenter’s authentication failed, and he was told to run for his life, while Alexa called the cops. In between the varied topics, refreshments were available in another hall that also served as a massive exhibition showcase. Here, we got to mingle the sponsors and partners, grab cool stickers, take fun photos, eat great food and even stood a chance to win an Amazon Kindle Fire! It was exciting to learn that with machine learning, every device will be able to interact with each other, and all data can be accessed in such a way to make lives easier. This was made more apparent with a live demonstration of a small, voice-commanded, spherical robot, which could move around and change the color of its lights. The robot was then connected to the presenter’s computer via the cloud, showcasing Amazon’s own game engine called Lumberyard, where moving a robotic character in game also resulted in the movement of the robot on-stage. 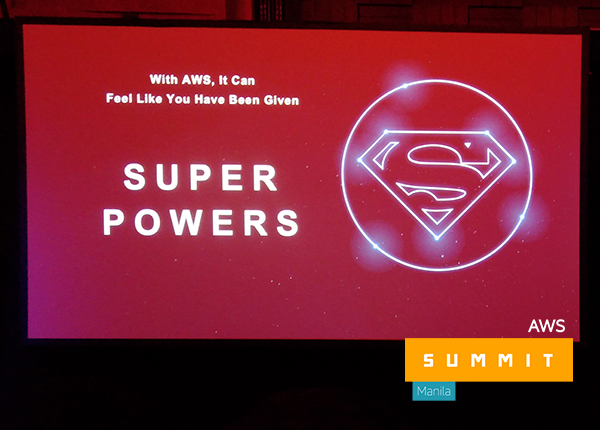 Overall, the Summit was a vibrant and eye-opening discussion, and experience into the services Amazon offers. As Amazon says, they aim to give people and businesses superpowers. They underscored that innovation is not a goal, but an ongoing process. Their aim is to build the technologies to push people to innovate.